There are plenty of reasons why diving is important to the tourism industry in Jordan. But, like any sector in a booming industry, finding success in it is not always easy. Here is the story of a group of friends, small businesses, and passion, driving real change in this vital but oft-ignored sector. The past few years haven’t been easy for small business owners in Aqaba, especially those who run dive centers. Tourism in Jordan faced a number of setbacks in the past few years, which greatly decreased the number of international tourists visiting Jordan, especially those who also dive. New ideas and solutions were urgently sought by the dive centers, such as diversifying their customer base so they are not totally reliant on international tourists. 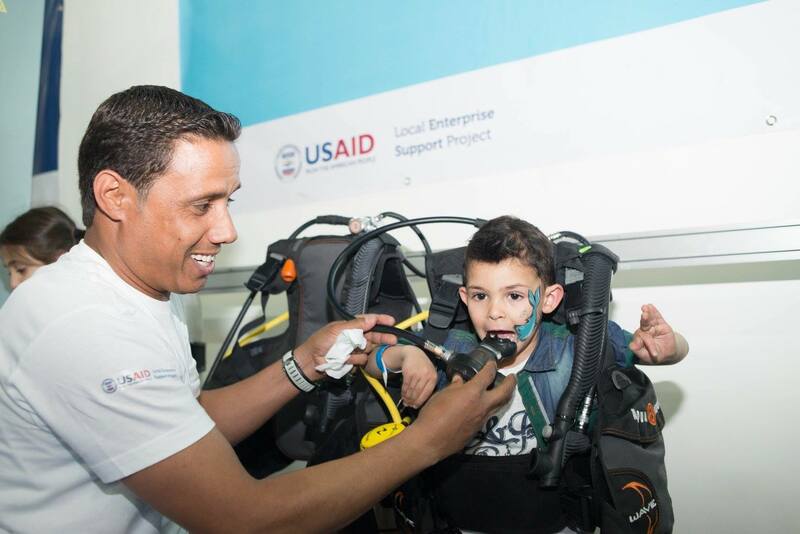 As a result, the USAID Jordan Local Enterprise Support Project (LENS) organized the Jordan Dive Show in 2016 to promote diving to Jordanians, in cooperation with the Aqaba Diving Association (ADA). The results were phenomenal. Not only was it the first ever dive show organized by Jordanian diving companies, it was also the first time all these businesses have come together to show locals a side of Aqaba many never knew. The Aqaba Diving Association was founded in 2010 by a group of dive masters and dive center owners in Aqaba. The association’s primary goal was to coordinate between all dive centers, address problems in the sector, and come up with new ideas, initiatives, and activities to revive the sector. At first, ADA members lacked the proper foundation needed to establish an association. They contacted a number of associations to find out how they did it, as well as the Ministry of Environment, before doing so. However, after founding, small businesses in the tourism sector in Jordan were floundering. “And that’s when USAID resuscitated us,” as one member put it. Almost two years after the Jordan Dive Show, we sat with a few members of the ADA to discuss the progress of the sector since then, and to address upcoming activities and initiatives. “Before the Jordan Dive Show, there was no support or care for the association,” the same member states. “I was expecting two chairs and some banners – that type of event. But when I entered… That was what resuscitated us. People started talking. We became known”. ADA board member and dive center owner Mohammad Qatawneh recalls the following: “I remember walking into the venue with an overwhelming sense of infatuation; I just couldn’t believe we were standing in this amazing event, organized for us. It was the first time an organization showed care for the sector and association. I’ll never forget that feeling”. With the huge exposure these small businesses received through the dive show, dive center owners developed a sense of responsibility and understanding of the crucial role they play in the success of the sector. Members are now more focused on the overall vision of the association, which is promoting Jordan’s diving industry by coordinating the efforts of the diving community and spreading awareness on the importance of protecting marine life. One of the most prevalent problems that faced the industry in the past was that most paying customers were tourists and expatriates, whereas now, diving is gaining huge popularity among Jordanians. 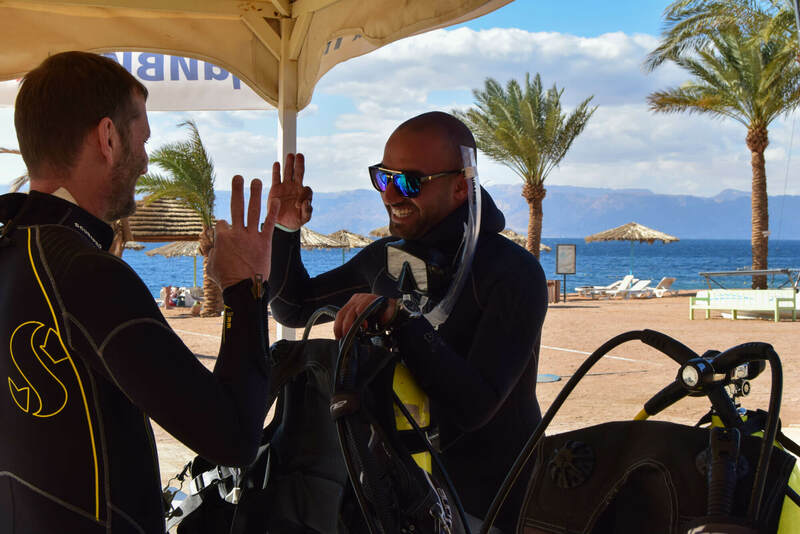 In fact, there are over 500 PADI-licensed Jordanian divers who were trained and licensed in Aqaba; a number which has drastically increased since organizing the first dive show. 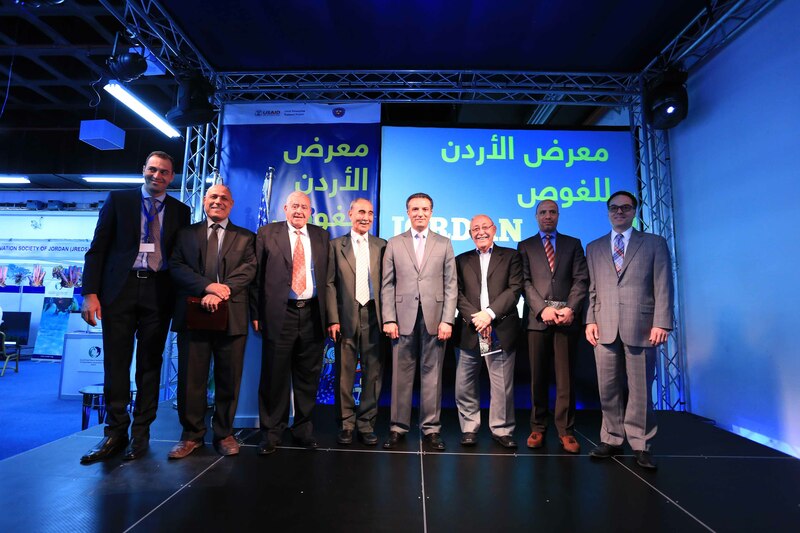 The buzz created by the Jordan Dive Show also resulted in the opening of at least three new dive centers in Aqaba. Given Aqaba’s potential for becoming a global prime diving destination, USAID LENS awarded a grant to the ADA to continue developing this thriving sector. The grant allowed for the restructuring of the association and the development of a stronger foundation for growth. This included hiring a manager for the ADA to oversee its activities, provide administrative support and facilitate communication between all members. The ADA has faced many challenges since its foundation, from coordinating between centers to navigating the tricky relationship with different associations in Aqaba. Addressing important issues and violations that harm marine life and threaten dive sites has always been tough for the ADA, but with the right structure and support, their efforts are slowly paying off. “Some fishermen work outside their designated areas. They harm the corals in the process,” a member tells us. “We have contacted the association of fishermen, and they promised us to remedy that. Now you can at least report boats that are violating the law, and that adds accountability. It’s been a tough journey, but it’s great to see that we finally have a voice”. Despite the small scale of ADA’s initiatives, members strive to make an impact and commence a change. Among ADA’s future initiatives are regular clean up dives, executed with the help of volunteers, as well as regular documentary screenings of films and videos that aim to raise awareness of protecting our sea. “The primary target” explains one member “are school children. They are very important”. USAID LENS has partnered up with the ADA again to organize a second dive show in Aqaba this upcoming May, with new additions and activities that ultimately aim to raise awareness of the small businesses working in the sector among Jordanians and tourists, as well as inform people about the importance of protecting marine life. ADA members are all lovers of the sea. “I learned diving since I was a child. My dad was a diving instructor, and he showed me sea life for the first time when I was 12. Ever since then, I wanted to become like him, a diving instructor, and I persisted,” one member recalls. In the future, ADA members will seek to introduce many more initiatives and activities, but for now they would like to start with the basic steps. “We have made it easier for centers to communicate with each other. Even centers in nearby diving destinations are aware of us now, and we are connected to them” said ADA member and dive center owner Isaac Tarawneh. "The goal is connection, a cleaner sea, and a healthier environment". ADA members are aware of the importance of their mission to create a cleaner and safer environment in Aqaba’s sea. “I have my plots of land and my real estates,” told us ADA Chairman Khammash Yassine, “But I care about this sea the most. I do what I do for Aqaba, I do it for my country, and I do it for the sea”. With the passion, drive and professionalism that these dive centers have, the future looks promising for Aqaba’s diving industry. “One of the advantages that we have here is that any dive master you meet speaks several languages, and that’s something you rarely find anywhere else in the world. We are able to communicate with tourists from all over the world easily and effectively” added Isaac Tarawneh. “You can’t visit Jordan and not go diving, just as you can’t come here and not have Mansaf. It’s part of our culture and history”.